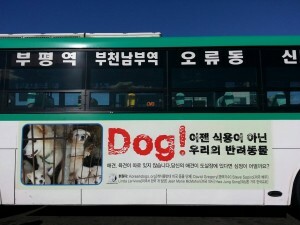 Home / Blog / 2016 Bus Ad Campaign – Please Help Nami Kim Save Korean Dogs! We need your generosity and compassion for the millions of dogs in South Korea’s dog meat trade. 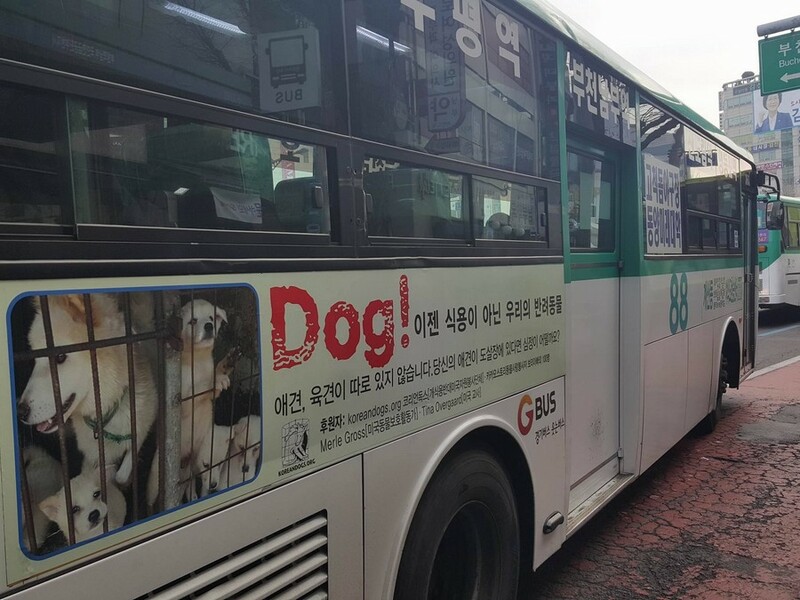 In order to continue the bus ads that began running in February, 2016, targeting the dog eaters in Incheon city, known for its high dog meat consumption, we need kind generosity from you. These ads are unprecedented in Korea. “Dog! Dogs are not for eating – they are our companions. There is no differentiation between a ‘pet dog’ and a ‘meat dog’. In order to continue the ad, $16,000 needs to be raised for the next four months. This covers ten buses at $400 per bus, per month. 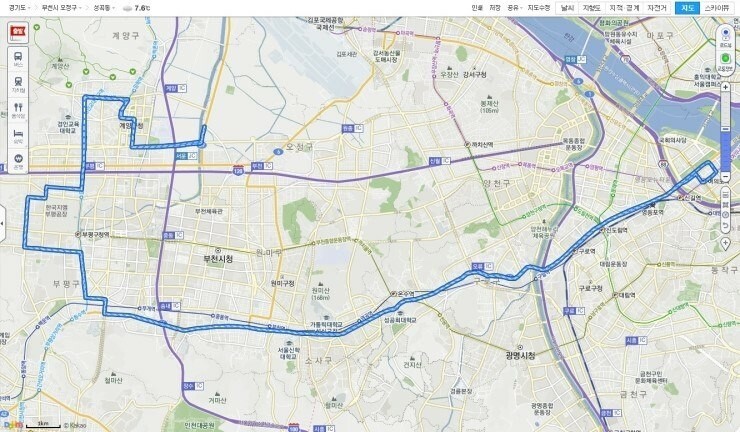 Bus line 88 travels through three cities: Incheon, Bucheon and Seoul (a three hour route), the longest bus line with 200 stops and 30,000 passengers a day. It runs all day long from 5 am to 12 midnight. This ad has already triggered a movement of animal lovers in Busan City and Yangsan City where flyers were distributed inside the bus. The hope is that this will spread to other cities. SaveKoreanDogs is a small group of activists fighting the dog meat industry in Seoul and the surrounding cities in Gyeonggi province, including Incheon, Bucheon, Gimpo, and others. They are independent and not supported by any groups or organizations. The rescue team and the campaign team have their feet on the ground, educating people about the horrors of the dog meat industry and saving dogs from a brutal death. In addition, the team continually raises its voice to the Korean government, urging that a ban on the dog meat trade be enforced. The high demand season for dog meat trade is just around the corner. We appreciate any donation that you can give. No amount is too small. We thank you with all of our hearts! This dog eating nation’s government turns a deaf ear to the cries of the dogs. It is best we turn to the dog meat consumers and let the dogs speak directly to them. This is the donation link for the bus banner. Let’s save some “meat dogs” (I hate this word) from the boiling pots this summer. Donate to help Nami Kim and her team save Korean dogs!! PLZ LET me Know how I can help TQ.